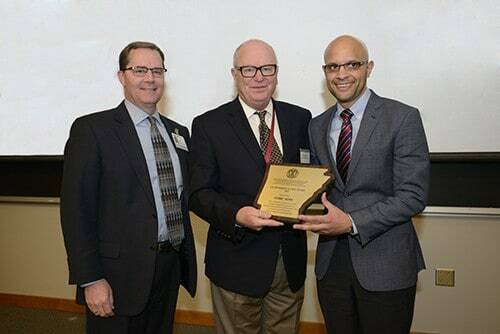 Jyric Sims, M.H.A., (right) receives an outstanding alumnus award for the Master of Health Administration program from MHA Alumni Association President Mike Perkins (left) and Richard Ault, M.H.S.A., MHA program director. March 3, 2016 | LITTLE ROCK — Jyric Sims, M.H.A., has been named the 2016 outstanding alumnus of the year by the University of Arkansas for Medical Sciences’ (UAMS) Master of Health Administration program. Sims, the senior vice president and chief operating officer of Tulane Health System in New Orleans, graduated from the UAMS program in its Fay W. Boozman College of Public Health in 2007. Sims, who was born and raised in Baton Rouge and now lives in Metairie, said he was “humbled and honored” by the award, which was presented by Ault during an alumni luncheon Feb. 26. “This is a true honor. I am so blessed and fortunate to have lived, trained and mentored at UAMS. Without the rigorous academic and practical learnings, along with friendships developed, I wouldn’t be where I am today. It’s at UAMS that I learned health care is a people and service business. I am so lucky to be operating in my passion and to have the ability to serve our nearly 2,000 employees, physicians and most importantly, patients,” he said. Before joining Tulane Health System, Sims served as vice president and chief operating officer of HCA St. Lucie Medical Center in Port St. Lucie, Florida; associate chief operation officer and ethics and compliance officer at HCA Clear Lake Regional Medical Center in Webster, Texas; and director of regional and international operations of The University of Texas MD Anderson Cancer Center in Houston, where he was also an administrative fellow. Sims also teaches in Tulane’s graduate program in health administration as an adjunct professor. He is a Fellow of the American College of Healthcare Executives and is on the board of directors of the Louisiana Chapter. He is on the National Diversity Advisory Board for Louisiana State University, where he received his Bachelor of Science degree. He is also slated to graduate from the New Orleans Regional Leadership Institute in April. Sims has received numerous other honors, including the prestigious Modern Healthcare 2015 Up and Comers Award, 2015 Millennial of the Year by New Orleans Social Renaissance, 2015 LSU Alumni Spotlight Award and 2014 Top Business Professional of South Florida by Legacy Magazine.